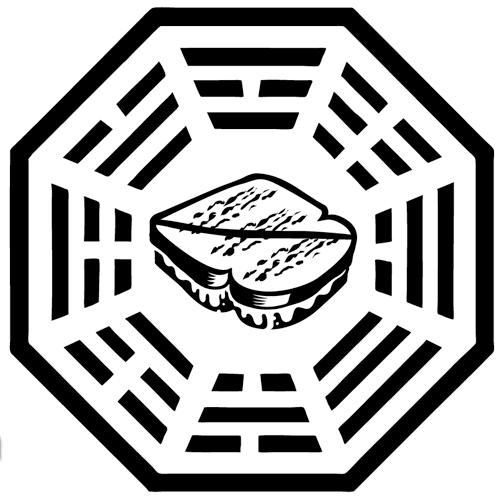 As promised in the first purchaser letter a new clue is given after Thanksgiving, it is a DHARMA logo with a sandwich in it. The only thing that springs to mind immediately is the Dharama Buns Sandwich Co. in Lowell, Massachusetts. Grill 44 in New York. The Unsomnambulist has told us that another potential reveal location is The 44th Ward, the self proclaimed grilled cheese funhouse in Chicago. Their Twitter site was updated a couple of days ago to say Pete Wentz would be dining there, and as we know Pete has been involved in the project before. Thanks to Jason for being the first to notify us via email. Tasty! And I'm not talking about the turkey from yesterday. It's a stretch, but there is a Bistro in Perth, Australia - 44 King Street located at 44 King Street. Wow, Tyson listened to me! Someone posted that yesterday and when I saw the clue, thought it's prob going to be that. Shame, I liked austrailia more. Another NY reveal? Doesn't seem very adventurous. Looking like a Sunday or Monday reveal do we think? Just arrived at the office and stuff to do. Will check back in a while. That be a grilled cheese sandwich by the looks of it. Just noticed the reference to Dharma Buns Sandwich on front page. Holy ARG's!!!! Never knew about the place (and I'm 45 minutes away). If this is the location of reveal, I'm so there!!!! My money is on the 44th Ward Dinner Party restaurant in Chicago, IL... which bills itself as a "grilled cheese funhouse." Thus the yellow/orange in the #44. Good early hours of the morn' ARGers! Happy Black Friday...err if you could say that! grill44NYC is Indian and Pakistani food, so again, I don't think that's it. JPL -- I to thought DHARMA Buns as soon as I saw the clue!! *Sighs* I was so looking forward for it to be in Australia. I mean... Where did Oceanic 816 come from? AUSTRALIA! I have yet to go back and catch up on previous comments, but lostie -- have se had anything that definitely says it ISN'T Australia? 3rd clue should hopefully bring us closer to where the reveal will take place. Although I'd love for Dharma Buns... the King Street Bistro in Australia has a lot of references to "44" (name, address, and latitude). I found this: Maize and Blue Deli. It's a deli in Ann Arbor Michigan. But have no idea what 44 would have to do with it, unless it's a player. While the 44th parallel north runs through Michigan, I don't know if it runs through Ann Arbor. Wyoming is the 44th state, but beyond that I think I need a nap! Maize and Blue Deli -- menu order #44 is a Triple Play Sandwich? The 44th Ward Dinner Party restaurant in Chicago, IL. 44 is in its name. It's tagline is "The Grilled Cheese funhouse." Let's see if DCAAPB serves us up another clue for lunch today. Even with all the turkey yesterday, I could still go for another slice of clue pie. The Unsomnambulist -- Again would LOVE a CHI reveal, but where does the gold color to the font for the "44" fit with 44th Ward Dinner Party restaurant? Or are you saying that just refers cheese? The Unsomnambulist -- sorry, I posted that question before I refreshed. Also, the 44th Ward Restaurant has a club night w/ DJs on Saturdays... nail in the coffin. ".... our good friend Pete Wentz will be dining with us this evening. Come get in on the action around 9:45p!" Pete Wentz from Fall Out Boy. Was just googling and saw this: The 44th Ward Dinner Party (a.k.a "The Ward") is a grilled cheese-focused eatery with late-night hours and music curated by DJ White Shadow Paul Blair. A handful of guys from Angels & Kings are behind the concept, including LBC owner Stephen Westman partnering with Nicholas Scimeca and Jason Merz. , thanks to the design help of Matt Eisler and Kevin Heisner (Bar DeVille, Empire Liquors). Angels and Kings (CHI) is a newish bar in River North, part owned by FOB's Pete Wentz. I've updated the main page with the 44th Ward info. I guess I'm there if it turns out to be The 44th Ward Dinner Party! Quick reminder...Last chance to sign up for the Frame 14 Swag (Castaway Getaways Folder) Raffle style give away is 11:59 PM tonight. and of course, right when we go to bed, another clue. Just as it always happens ! The 11:59 end time for the Frame 14 Swag give away is Central time. DO you think there is any chance of a reveal this weekend? A reveal this weekend would keep them on schedule. Can't wait for this one!!!!!! I have been hoping for a CHI reveal for the longest. Plus, Grilled Cheese? I am stoked and I only live about 8 blocks away!!! I could go , get some swag, eat a bunch and walk off the calories on the way home!!! Total win!!! Great job, it looks like Chicago is the place. Hope it holds til Sunday so I have access to a faster connection. Love the DHARMA Sandwich. @Zort Don't worry, your DHARMA Polo is still my favorite! John, yes it looks like they are taking a leaf out of my book in creating reveal based DHARMA logo's. Well they're closed on Tuesday, so if this is the place the reveal won't be then. Holy Grilled Cheese! Ob_, one question. Do you ever sleep? How certain are we? Can I see a show of hands? :O I'll start collecting Twitter names but will hold on posting until Tyson sends the official invite. BTW, walked by this place while in Chicago for ZapIt2Lost gathering in September! Great LOST fans within a block of 44th Ward. So "should I stay, or should I go?" Also if this is the place it looks like it will be an evening or night time reveal. Chicago is central time. One hour earlier than Eastern. Dennis has posted a new Sneak Peak on the main blog, but keep the clue talk in this post for the moment. Also the other good news is that the clips are now available in countries outside of the US. oooowwww...a URL of cheez wiz sprayed on a sandwich! Sayid'sgirl, Zort removing the Anon's was a good call. Made a difference. "Grilling" --- LOL. I wondered about that in the first purchaser letter and now we know! I'm still in North Carolina, heading back to Maryland in the morning. Have laptop, will travel! Pumpkin Pie..ya just gotta go if its possible . A cheese sandwich nite club..is sooo out there..It'd be great to see it thru your eyes. Chicago! Lakeview neighborhood! My old stomping grounds! I grew up less than a mile from there. Great sleuthing everyone....away from laptop until tonite! Grilling sure seems like grilled cheese sandwiches. Agreed, Sayidsgirl, seems like old times here again! FYI: ABC store is having 30% off sale! Sorry, it took so long to restore normality (if there is such a thing in a Lost ARG). Hopefully we will be trouble free until the end. If this is a Chicago reveal, I will be in heaven. hhhmmmm.....Dharma Octagon Grills...the new wave in outdoor cooking.. It's got to be tough to keep on top of a very busy blog site. You're doing a great job!! ...The END!!!?? ?...There Is NO ENNNDD!!! ..paste Blutto's ( John Belushi) tirade from Animal House here. BTW maven Elizabeth makes me smile every time I see a new picture of her. She's such a beautiful little girl. "There's Still Room to Sign Up for Trivia Night! We still have open spots for teams who want to participate in our first Trivia Night on Wednesday, December 2 from 8 to 10 PM. It'll be hosted by our head chef, Punk Rock Gary (a.k.a. "PRG")! All questions will be originals the entire staff is collectively working to come up with. They'll be dealing with pop culture (music, movies, TV, video games and, yes, even literature), world history, science and technology and the culinary arts. It'll probably (hopefully) be more difficult than your average trivia night, but we'll be giving away some awesome prizes to our top scorers to make up for our obscurity. You can come in and sign up with our counter staff any time between now and Monday, November 30. Participation will be team-based so you can sign on an additional 3 friends to join you." I like the 44th ward idea cause the sandwich in the logo looks like a grilled cheese. BUT the the Dharma Buns does have the sandwich in logo...... But now I HAVE to go to Dharma Bus if i ever go up east! That is surely a "grilled cheese" sandwich. I wonder if Pete Wentz could have dropped off swag as he was just at the 44th Ward on Oct 23rd? A "bun" would be the rounded shape- so I don't think it would be Dharma Buns. I also learned the restaurant is located in Lowell, MA, birthplace of Jack Kerouac who wrote "Dharma Bums." Restaurant name is a cute play on that novel's title. Erin - you may be on to something wtih Trivia Night - will be fun to see how this all plays out. Oh Chicago! I lived there during college! I wonder if the poster drop will be on Cyber Monday to correspond with the retail world, haha. Meant November 23rd- no time travel. Jesse t, if you have any sort of framing stores, one like Aaron Brothers, Reuel's- I would take it in to a place like that. They'll probably have more options pre-made frame wise, but also might be able advise what type of frame will work best for you if you went a more custom route. I think this is what I will do! seings that Amy took off for awhile..please allow..
Samich Argies, Cheeesh, don't you want to go? A GCS for a URL and don;t be late! Just stay for the Url and we'll all get our poster fix. and they're gonna do it again. Argie won't you tell me.. that you'll be my friend someday. Mel- to the tune of? Sorry I'm daft. Also- PW's flagship store for Clandestine Industries in in Chicago. JT...Sweet Home Chicago..as done by Muddy Waters,,Willie Dixon..etc..A " must" for any Blues player..THE Classic, Chicago Blues. I saw Damon Lindelof this morning at The Grove. I would have said hello and told him how much fun we are having with DCAAPB but he had his, very cute, little boy with him. Who happened to be sitting in the middle of the sidewalk in front of Santa's house. I smiled at Damon the same time I recognized him, because he was saying something to his son, like "Are you comfortable there?" There are just times you can and can't approach someone. Omg, everyone always sees the coolest people at the Grove! I never see anyone there, but then again I am blind, so maybe I have. Actually that's probably true. Once at the Grove, I was in line at the Apple Store and it was taking forever. This guy turns to me, smiles and nods kind in this "this is taking forever" fashion. So I nod back like, "I know!" Then after we both finish our transaction, my friend runs up to me and says, "that was Seal!" And sure enough it was- but if I can't recognize him in person, I don't have a ghost of a change of seeing anyone else! PS Omg, the Grove on Black Friday that's brave! This Samich Argy does wanna go. LostiePat are you in Chicago? I do have a knack at spotting people, even when the aren't wearing make-up. Hallie Berry at Century City, by her voice. I heard her and told my friend Tom, we just passed Hallie Berry and he's like "No we didn't" so we stalked her into Bloomingdale's. We left here alone after the point was proven. Oprah once, who said "Good Morning" while we were walking Stone Canyon, by the Hotel Bel-Air. Probably more than anyone wanted to know. No way, Sam G - interesting sightings. Three JJ Abrams alumni in that list I see ;) . I have had a few sightings when I decided it just wasnt best to approach as well. Amy Acker (Angel,Dollhouse), in the coffee house I frequent, a couple of months ago. I've never met a Grilled Cheese Sandwich that wasn't cut diagonally. Why aren't GCS'es cut at the halfway point vertically? Any body know? Well after all this grilled cheese talk, I scooted out for lunch and got me a...grilled cheese sammich. From a place that specializes in cheeses; it was aged cheddar on a multigrain bread of some sort. It was pretty fancy pants , but boy it went down the hatch really well. Michael Emerson News (MchlEmrsnNews) is now following your tweets on Twitter. New clue! Guess it's confirmed for Chicago. yeah, Guess that means Chicago, I was hoping for Lowell, I live close to there. :-( Aw well. Nice with the Emerson, Zort! DA BEARS is new cluie. Wow so soon after I checked. Congrats to @unsomnambulist for being the first to suggest 44th Ward Dinner Party in Chicago as the reveal site - Go Bears!